I'm having trouble with labeling of short input fields. Some labels have standard 280px width approximately, but others are quite small in order to offer clues on the expected input (characters). I'm working with top-of-field labels, aligned vertically. 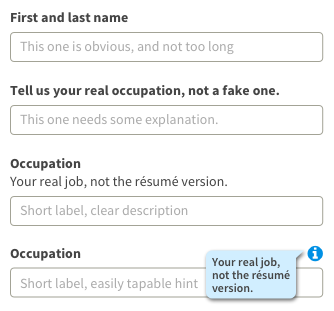 Users are very familiar with the different input fields, though, the form is prone to human errors, since the users fill them while talking on the phone, in a hurry, etc., so I want to show precise labels, and tooltips only to clear some additional info, but not to complete the text in the labels. I'm not sure to change placement of the fields to the right of the labels, precisely because there are going to be very long labels. And I believe top-of-field labeling could be the best approach. Tooltips are necessary in several cases, and even if the label is short, the tooltip will increase the label's length. EDITS on POSSIBLE SOLUTIONS: I've considered some suggestions, but still not convinced on the best solution to offer readable alignment, clear labels, realistic field length for visual clues. Keep the labels above. 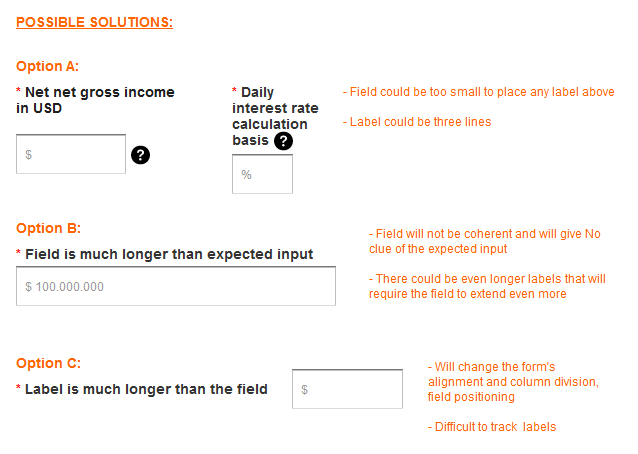 Users have an easier time scanning forms when labels and their fields are at a constant start position. Positioning to the right means you'll either have fields jumping all over or you'll waste a lot of column space on the majority of labels. If your examples are representative of the actual length, consider whether you might be saying too much in the label. Two options that work well when you find yourself explaining things in the label are description text or in-line help pop-ups. Use a short label for scanning and additional text to clarify. From the options provided, I would probably go with option B. But then again, the width of the input field should reflect the anticipated length of the user's input (difference between address and postcode for example). I think in your case, you should shorten the label to it's minimum, in this case: "Net amount", because you have the placeholder with the $, it should be clear that you expect a value in USD. TL;DR: Adjust the width of the input fields if you can't shorten the label. These are the solutions I worked on, based on your suggestions. 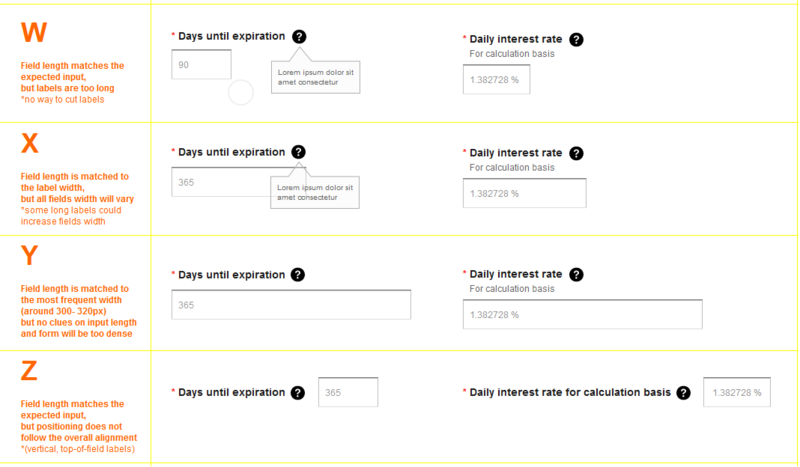 Users to intuit the expected input (format, average characters). The form to be beautiful, consistent. Please refer to the most suitable option, according to the needs above. Thanks! Not the answer you're looking for? Browse other questions tagged forms input-fields labels or ask your own question. 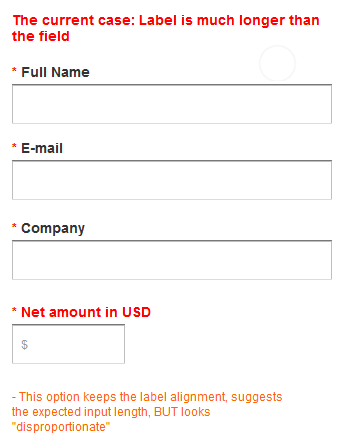 How wide should input fields be?